Olympia Auto Mall - Washington's Largest Selection of New and Used Cars: Test drive the highly anticipated 2017 Kia Sorento LX today! Test drive the highly anticipated 2017 Kia Sorento LX today! If you’re looking to learn more about and test drive the much anticipated 2017 Kia Sorento LX, you’ll find it ready and waiting for you at Hanson Kia, conveniently located in the Olympia Auto Mall. 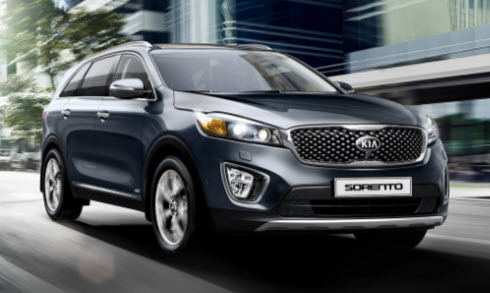 The Kia Sorento LX is set to impress with its myriad of features and latest tech! The addition of automatic emergency braking to the model has earned Kia a great deal of attention and respect on the market. The new Kia mid-size crossover SUV is available in 3 versions: Sorento LX, Sorento SX and Sorento EX. First and foremost, it doesn’t matter which version you invest in, you’ll get great features such as automatic emergency braking, forward-collision warning, lane departure warning and adaptive cruise control, standard. The 2017 Kia Sorento LX comes with a long warranty which is most convenient. It also achieves great safety standard and crash test ratings. According to Kia, the new Sorento LX is bred for adventure and it goes far deeper than just a sporty off-road aesthetic design! This crossover SUV offers a new Dynamax all-wheel-drive system that constantly monitors the road and driving conditions, a speedy turbo engine and drive-mode select. Drive-modes include: normal, eco and sport. It also offers all-new advanced tech for torque vectoring cornering control and precision-turning. Fuel economy is impressive with a city MPG rating of 21 and highway MPG rating of 28. The LX comes with a 6-speed shiftable automatic transmission. The 2.4-liter engine provides 178 ft-lbs of torque and 4000 rpm. The following features provide convenience and safety on the road: cruise control, electronic power steering, tilt and telescopic steering wheel, audio and cruise controls on the steering wheel. Check out the latest Kia models at the Olympia Auto Mall. You can schedule a test drive or just stop in and see the latest Sorentos and learn more about their features, handling capacities and comforts. At Olympia Auto Mall you will find a selection of 2017 Kia Sorento LX models to choose from. We encourage you to chat to us about your vehicle finance needs as well as the type of car you need to cater to your daily driving needs. Our sales consultants will help you to make the right choice. Want to learn more about the 2017 Kia Sorento LX or book a test drive? Contact us at Olympia Auto Mall today.